Could it be that Judas, the disciple of Jesus Christ that betrayed Him, repented and made it to heaven? This is an age-old question that many of us have heard discussed at different times. Many people want to believe that it is possible that Judas repented and made it to heaven. And it certainly seems possible that anyone who believes in Jesus Christ and genuinely repents of any sin (except the unpardonable one spoke of by Jesus) should be eligible for heaven. While we are not God and only He decides who enters heaven, we can still consider his situation. In the following verses, we see Judas was indeed remorseful and even verbalized that he had done wrong. Matthew 27:1-5 When morning came, all the chief priests and elders of the people plotted against Jesus to put Him to death. 2 And when they had bound Him, they led Him away and delivered Him to Pontius Pilate the governor. 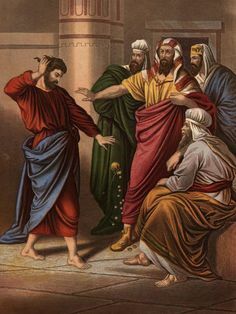 3 Then Judas, His betrayer, seeing that He had been condemned, was remorseful and brought back the thirty pieces of silver to the chief priests and elders, 4 saying, "I have sinned by betraying innocent blood." And they said, "What is that to us? You see to it!" 5 Then he threw down the pieces of silver in the temple and departed, and went and hanged himself. So if he was a true believer in Christ, would not it be possible for him to go to heaven if he repented in time? He was a remorseful person who wronged the Son of God, the Rabbi that he had been a follower and disciple of, for close to three and one half years, even though he stole from the moneybag he was allowed to keep for the ministry (John 12:6). Would a real Christian steal from the ministry monies he was in care of? Was Judas a true follower of Christ? Did he ever believe in Christ? John 6:63-71 “It is the Spirit who gives life; the flesh profits nothing. The words that I speak to you are spirit, and they are life. 64 But there are some of you who do not believe." For Jesus knew from the beginning who they were who did not believe, and who would betray Him. 65 And He said, "Therefore I have said to you that no one can come to Me unless it has been granted to him by My Father." 66 From that time many of His disciples went back and walked with Him no more. 67 Then Jesus said to the twelve, "Do you also want to go away?" 68 But Simon Peter answered Him, "Lord, to whom shall we go? You have the words of eternal life. 69 Also we have come to believe and know that You are the Christ, the Son of the living God." 70 Jesus answered them, "Did I not choose you, the twelve, and one of you is a devil?" 71 He spoke of Judas Iscariot, the son of Simon, for it was he who would betray Him, being one of the twelve. Early in the book of John, it does not look good for Judas. Some of the disciples were not truly “believing” including Judas (John 6:64) and this very same Judas was definitely called a devil (John 6:70-71). The Lord spent much time in prayer, the night before the crucifixion. And much of His prayer is recorded. By this time, all of the believing disciples were secure in their belief in the Lord according to John 17:8 above. Save one. None were lost but Judas, the son of perdition. This clearly shows Judas was not a believer at the time of this prayer. Here is a tough question. Can Satan enter a Christian? Do you think the devil has any trouble entering in and out of his own? Luke 22:1-6 Now the Feast of Unleavened Bread drew near, which is called Passover. 2 And the chief priests and the scribes sought how they might kill Him, for they feared the people. 3 Then Satan entered Judas, surnamed Iscariot, who was numbered among the twelve. 4 So he went his way and conferred with the chief priests and captains, how he might betray Him to them. 5 And they were glad, and agreed to give him money. 6 So he promised and sought opportunity to betray Him to them in the absence of the multitude. It looks pretty bad for Judas. But there is more. John 13:21-30 When Jesus had said these things, He was troubled in spirit, and testified and said, "Most assuredly, I say to you, one of you will betray Me." 22 Then the disciples looked at one another, perplexed about whom He spoke. 23 Now there was leaning on Jesus' bosom one of His disciples, whom Jesus loved. 24 Simon Peter therefore motioned to him to ask who it was of whom He spoke. 25 Then, leaning back on Jesus' breast, he said to Him, "Lord, who is it?" 26 Jesus answered, "It is he to whom I shall give a piece of bread when I have dipped it." And having dipped the bread, He gave it to Judas Iscariot, the son of Simon. 27 Now after the piece of bread, Satan entered him. Then Jesus said to him, "What you do, do quickly." 28 But no one at the table knew for what reason He said this to him. 29 For some thought, because Judas had the money box, that Jesus had said to him, "Buy those things we need for the feast," or that he should give something to the poor. 30 Having received the piece of bread, he then went out immediately. And it was night. So, not only once, but twice, two distinct times, Satan entered Judas. It does not sound as though the devil wanted to occupy Judas full time, but rather to use him at these two times. Once to “initiate the deal” with the murderous religious leaders and once to “keep the deal” he made with them, and see the betrayal through. Most of us believe that as a Christian, that we are safe from Satan and all evil spirits. Wouldn’t one think it impossible for a disciple and apostle (Luke 6:13-16) of Jesus Christ “to be entered by the devil?” Normally yes, but this one was His in name only. This one was really a false disciple. He answered the call of the Lord but it is recorded that he never truly believed on Him. It is recorded that Jesus called Judas lost, a devil (John 6:70) and a son of perdition (John 17:12). And by inference, that he was unclean (John 13:11) and did not really believe (John 6:64-65). No one can be a son of perdition and a son of God at the same time. We all belong to God the Father or the father of lies and evil, the devil. We are children of God or children of the devil (1 John 3:10). It is easy for the devil to go in and out of his own. But he cannot do that with God’s children. It might be appropriate here, to show a bit more of Judas’ heart. Matthew 26:14-16 Then one of the twelve, called Judas Iscariot, went to the chief priests 15 and said, "What are you willing to give me if I deliver Him to you?" And they counted out to him thirty pieces of silver. 16 So from that time he sought opportunity to betray Him. Imagine. Judas heard that the chief priests wanted to seriously kill his own Rabbi, whose ministry he was serving under (for over three years). And even if it was by Satan’s leading, Judas went to the very ones that wanted his Rabbi dead and asked them how much they would pay him for helping them seize Jesus out of the public eye (for they feared the people). And Judas did not relent on his deal. It says that from then on, he “sought opportunity.” The ministry thief, the one who stole on a regular basis from Jesus Christ’s ministry money, entrusted to him by Jesus Christ Himself... now was willing to “sell the Lord out” to the very ones who wanted to kill Him. But let us continue. Let us return to the night of the Last Supper and consider more Scripture. John 13:6-11 Then He came to Simon Peter. And Peter said to Him, "Lord, are You washing my feet?" 7 Jesus answered and said to him, "What I am doing you do not understand now, but you will know after this." 8 Peter said to Him, "You shall never wash my feet!" Jesus answered him, "If I do not wash you, you have no part with Me." 9 Simon Peter said to Him, "Lord, not my feet only, but also my hands and my head!" 10 Jesus said to him, "He who is bathed needs only to wash his feet, but is completely clean; and you are clean, but not all of you." 11 For He knew who would betray Him; therefore He said, "You are not all clean." Matthew 26:20-25 When evening had come, He sat down with the twelve. 21 Now as they were eating, He said, "Assuredly, I say to you, one of you will betray Me." 22 And they were exceedingly sorrowful, and each of them began to say to Him, "Lord, is it I?" 23 He answered and said, "He who dipped his hand with Me in the dish will betray Me. 24 The Son of Man indeed goes just as it is written of Him, but woe to that man by whom the Son of Man is betrayed! It would have been good for that man if he had not been born." 25 Then Judas, who was betraying Him, answered and said, "Rabbi, is it I?" He said to him, "You have said it." Of the unclean one, the betrayer, Jesus said “woe to that man” and the words that make me doubt Judas made it to heaven more than anything else, is that Jesus said, “It would have been good for that man if he had not been born." If Judas was going to (1) actually believe on Jesus Christ and (2) actually repent to God, in time to make it to heaven, would Jesus have said that about him? It is up to God, who enters His kingdom (or not). It has been said, that upon arriving in heaven, many are surprised at who made it to heaven and that many are also surprised that people, who they surely thought would be there, were not. Only God knows our real hearts. We know the thief on the cross next to Jesus made it. But if Judas is in heaven when we get there, it will surely be a surprise to many of us. Please Note: This is in the consideration that suicide is a sin (murder of self), and that there is sometimes an “amount of time” between “the act and actual death” whereupon a person might seriously repent of taking their life.